13 - First meeting held for European charismatic pastors. Several times during these years of meetings, Williams traveled throughout Europe with David du Plessis where they would speak at different Universities and churches, following a busy schedule set up by du Plessis. Many Spirit filled ministers, they found, hungered for fellowship with other like believers, and asked Williams to set up such a meeting. He did so with the first meeting held at Schloss Craheim, a place that also was used for one of the Catholic/Pentecostal Dialogues. 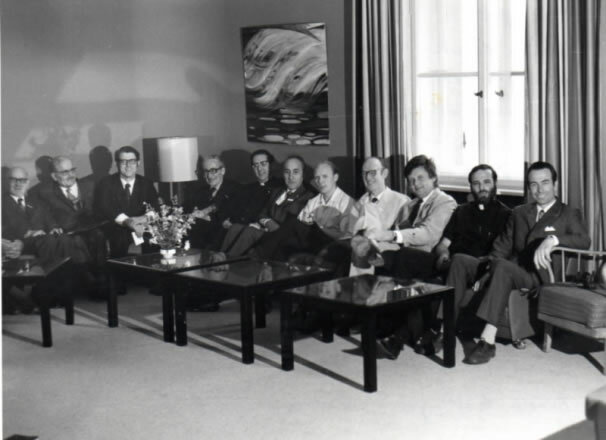 From left to right in picture: Thomas Roberts-Wales, Emil Dalliere-France, J. Rodman Williams, Leslie Dorn-Denmark, Paul Regimbal-Canada, Jean-Daniel Fischer-France, Sandy Shaw-Scotland, David Bailie-North Ireland, Fred Cadenius-Italy, Athanasios Emmert-Greek Orthodox, Arnold Bittlinger-Germany.